A landscaping project is a great way to refresh your property. 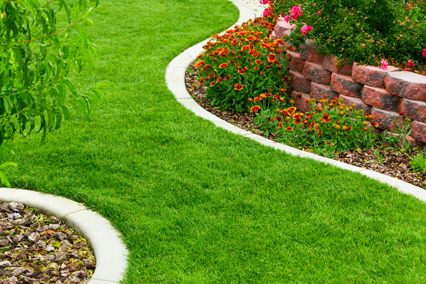 Landscaping improves the curb appeal of your home. It also enhances the way you enjoy your home. In addition to how the space will be used, your own personal style and the style of your house will influence the landscape. The design and layout of your landscaping project will also depend on your budget and the size of the site. There are countless of different ways you can design the landscape around your home. A landscaping project might have a range of elements, from walkways and driveways to gardens and water features. You can plant trees, flowers and other plants as well as flower beds and other types of gardens in your yards. Landscapes might also feature hardscaping like walkways and driveways featuring any number of materials like interlocking pavers, gravel and asphalt. You might also want to install a fire pit or an outdoor fireplace as well as lighting. When designing a landscape around your property, keep in mind how you want to use the space. Having a vision will help you decide what elements you want to introduce to your yard. It will also help you create a functional and practical space that you will use and enjoy. Having the eventual use in mind will help you decide whether you need garden furniture or if you need space to build a deck or a patio to entertain guests. Or you might want to build a water feature like a pond or have a relaxed spot to chill out around a fire pit. Need professional help or just a bit more inspiration? Fill out the form below to receive landscape design estimates from approved landscape designers and architects in your local area. Whether you're in dry areas such as Yuma or Santa Fe, humid climates like Daytona Beach and Honolulu, or colder locations like upstate New York, this service can match you to qualified professionals that understand your area's soil, rainfall and weather patterns. If you are looking to create a low-maintenance lawn or garden, you need to plan ahead. Many yards become hard to maintain because they are put together piecemeal. Hiring a professional landscape designer or an architect is one way to plan, although you can do it yourself if you have the time and a clear vision. Create a plan for your site trees, garden features, and other structures. Before doing anything, take the time to know about the soil and light conditions of your yard. This will help you decide where the best place will be to plant and minimize care. A simple design will ensure an easy to maintain landscape. Avoid adding flourishes like a water feature. You should also plant perennial flowers rather than annuals or plant trees and shrubs as low maintenance alternatives. Planting native plants is a great way to minimize maintenance since you know that they thrive in your area's weather and soil conditions. Place flowers together in clusters rather than in various spots and install borders around gardens to make mowing around them easier. To reduce the need for maintain and mowing grass, cut the size of your lawn or replace it with hard landscaping like interlocking pavers or gravel. Using mulch also reduces maintenance by acting as a barrier for weeds and fertilizer for soil while holding in moisture to reduce watering. There are a number of ways to infuse character and uniqueness to your back or front yard. Having eye-catching accents is a great approach to creating a unique landscaping project. A cool way to create unique landscapes is by repurposing bathtubs, cinder blocks, toolboxes, ceramic bowls, buckets and even toilets. These and other unusual items can be used as unconventional flowerbeds or containers for growing vegetables and herbs. Other unusual accents include incorporate old doors and window frames as elements in your garden. The windows can be used as shelves for potted plants or a spot for vines to grow. Natural accents are another way of making your lawn or garden look distinctive. For example, use twigs and copper wire to create a nest around the rim of a birdbath. If you have antiques, you might also want to infuse them into your garden. For example, you can use old pots and wicker baskets or create a decorative feature by hanging antiques like old watering cans, shovels and tools along a solid fence. A great way of focusing your efforts is by picking a theme. This will help you group different elements of your landscape together. Themes can range from wildlife and shapes to garden tools and camping. A fun theme would be practical items in impractical places. To achieve this theme you can place items like a chair in a flowerbed. Another way to achieve this theme is to repurpose items like putting marbles or a flowerbed in a birdbath. You can also use one or more colors to bring together your yard. A color scheme will help you decide on flowers, furniture, materials and other landscape features. Whatever theme you choose, it should be practical as well as aesthetically pleasing.